The 1837 publication of Samuel Lewis’ ‘A Topographical History of Ireland’ painted a picture of Ballinaclough (Ballynaclough) at that time as a prospering parish situated on the River Arra with 1149 inhabitants living across 3,701 statute acres. It highlighted Ballinaclough’s improved agricultural systems (presumably cultivating wheat, oats and potatoes on conacre; though not specified) along with its high quality quarry and a small corn mill. The writer of this positive piece could not have foreseen the effect that a national disaster would have on this small parish – much like the rest of the country – less than ten years later. The official census of 1851 records the population of Ballinaclough as having dropped by a third – to just 774 people – with 375 having left the parish by one way or another in the intervening years. To put this into perspective, 654 people lived in Ballinaclough according to the 2006 census and this would be the equivalent of wiping out more than half of those at that time. But this dramatic drop of 375 people arose from a number of possibilities. Emigration and death due to the famine were the main causes but we cannot look beyond the lack of rejuvenation in the population – young couples were emigrating and their children would not replace the seniors dying due to old age and other ailments. The effects of this would continue to be seen in Ballinaclough for decades to come. An examination of Ballinaclough in the mid 19th century cannot be undertaken without first looking at the circumstances of life in the parish and those who facilitated this. The Bayly Family were the main landlords of Ballinaclough in the 19th century. Unlike the national stereotype of the time of landlords being part of an elitist landed gentry, the Bayly’s were known in Ballinaclough as good and fair landlords. They were considered to be the poor man’s friend. At the time of the famine, the family owned almost 50% of the land of Ballinaclough and farmed 703 acres themselves. It is evident therefore that the tenant farmers of the parish were extremely important to them and a national catastrophe forcing mass emigration would have dire effects on their own prosperity. At the dawn of the famine, John Bayly of Debsborough was High Sheriff and also held the position of Deputy Lieutenant and magistrate, while his brother Richard Uniacke was also a magistrate. These men were pivotal in providing public works schemes for the parish of Ballinaclough at the time of the famine and it could well be argued that Ballinaclough received a better proportion of support due to the Bayly influence at this time. Agriculture provided the main source of employment for the people of Ballinaclough in the 1840s. Prior to the famine, of the 174 families living in Ballinaclough, 150 of these were involved in farming. That represents a massive 86% dependent on agriculture. With the exception of the Bayly family, who owned an extensive area, the bulk of the land was farmed by tenant farmers. In 1845, 3% of farms ranged from one to five acres, while 57% were over twenty acres. Animals kept on these farms included horses and mules, horned cattle, sheep, pigs and asses. Poultry was also reared. Wheat, oats and potatoes were cultivated. being used as fertilizers, thus increasing crop yield. A farming society had recently been set up in Nenagh. Stating that the usual size of tillage farms in the area was from one to fifty acres, he added that the rotation of crops was wheat and potatoes or oats and potatoes. Most grazing farms were in the hands of the gentry. He painted a pleasant picture of landlord and tenant working in unison, and ironically remarked on the abundant wheat crops of the previous few years. When rents were not paid, animals or crops were usually taken by the landlord in lieu. He was only aware of a handful of instances in which this had happened. He pointed out that most tenants in the locality had a lease for life, and some landlords, including his brother, contributed half the cost of improvements to the land or buildings. Large scale farmers (over fifty acres) were improving their lot while the smaller tenant farmers were just barely existing. Labourers depended mainly on the landlord for work, where they received 8d per day. Tenant farmers employing labourers usually paid with potatoes. By 1835, Ballinaclough had three schools within the parish – one Protestant and two Catholic. The parochial (Protestant) school was run by Daniel Patrick and had 36 pupils (18 male and 18 female). Basic reading, writing, arithmetic and book keeping were taught. It was supported by patrons in the locality and the aforementioned Topography lists John Bayly Esq. as being a patron. It is obvious that the pupils came from surrounding areas to that school, as the local Protestant population was quite low. The remaining schools in the parish – the day school and the day/evening school – were Catholic. These schools were both “pay schools” with their sources of support being listed as “small payments from children”. The day school in the chapel, run by P.F. Noble, had 42 male and four female pupils and taught the same subjects as the parochial school with the addition of grammar, algebra and geometry. Finally the day/evening school was run by J. Costelloe and had 45 pupils, 41 male and 4 female. The fact that 127 children in Ballinaclough were availing of an education would imply that a large percentage of children were attending school. The fact that the two Catholic pay schools were growing may signify a level of financial sufficiency, but the lack of female students did little to improve the high level of illiteracy amongst women. The level of literacy in Ballinaclough was, however, higher than the barony average. Ballinaclough prior to the dawn of the famine. In 1851, Ballinaclough had 310 parishioners who could both read and write. This was almost half of the remaining population. In addition to this, a further 135 claimed to be able to read, leaving us with 445 individuals (out of 774) with at least some level of literacy. Lewis painted an idyllic picture of Ballinaclough, sitting on the River Arra, which perhaps does not fully encompass the way in which people lived at the time. It probably wasn’t this golden age that was so poetically described and this can be seen from the fact that about 42% of the population of Ballinaclough lived in what fell under the classification of “third class houses”. A third class house at this time generally had two rooms. Slightly better off at this time were the occupiers of second class houses which comprised 33% of those surveyed. There were three first class houses in the locality: Ballinaclough House, Debsborough House, and Coolagh House. However with 24% of houses – forty-one homes – classed as fourth class, implying a ‘one roomed cabin or hovel’, deprivation did exist at the lower levels of society. 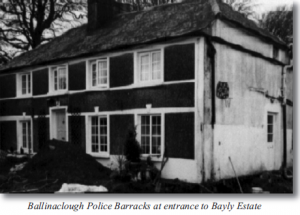 Security was provided by the constabulary who occupied a barracks at the entrance to the Bayly estate (pictured above). The perimeter of the parish was well protected by police stations at K i l k e a r y, Curraghaneddy, Dolla and of course in nearby Nenagh. Religious needs were met by two modern churches. The Catholic Church at Ballyquiveen was built in 1832 on a site donated by the Head family. It was extended in the 1850s. The Protestant church in the graveyard was built in 1815. The Ordnance Survey of 1840 also recorded details of the old parish church ruin with ‘its excellent 15th century masonry’, and the remains of Ballinaclough castle. The Great Famine which struck in 1845 affected Ballinaclough as much as any other parish in the surrounding hinterland. We can see this from the huge fall in population that occurred between 1841 and 1851. For whatever reason – death/emigration/etc – people left Ballinaclough and its population was not to recover. The results of the famine for Ballinaclough – along with a reduced population – can be seen in that the dependence on agriculture was reduced and people were forced to seek other sources of employment. Less people live in the area of Ballinaclough now than at the end of the famine. Perhaps that report on Ballinaclough from 1837 created a picturesque postcard of a locality in its heyday, blissfully unaware of the tragedy which lay around the corner.